Halloween is imminent and An Unlikely Story is getting ready to celebrate in the scariest way! 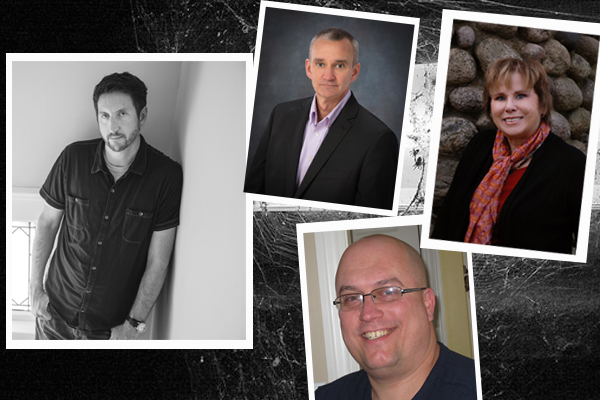 Join us and horror writers Paul Tremblay, Christine Lajewski, Tom Deady, and Pete Kahle for a spooky panel on writing horror stories. Each author will discuss their books, what inspired them to write in the horror genre, and share some of their own eerie tales. It’s a horror buff’s dream and we know you’re dying to see. Paul Tremblay is the author of Disappearance at Devil’s Rock, the Bram Stoker Award-winning A Head Full of Ghosts, and the crime novels The Little Sleep and No Sleep Till Wonderland. He is currently a member of the board of directors of the Shirley Jackson Awards, and his essays and short fiction have appeared in the Los Angeles Times and numerous “year’s best” anthologies. His newest book The Cabin at the End of the World is sure to keep you at the edge of your seat. He has a master’s degree in mathematics and lives near Boston with his wife and two children. Christine Lajewski grew up in Michigan and teaches alternative high school. She is a haunt actor every October. Her first book, JHATOR, is an exploration of grief and recovery through interaction with the natural world. It is written from a Buddhist perspective but has supernatural elements to it. Christine’s is a member of the New England Horror Writer’s Association and her first horror novel, ERRING ON THE SIDE OF CALAMITY, is a horror collection of bad choices and even worse consequences. Her second horror novel BONEBELLY releases October 2018. Tom Deady was born and raised in Malden, Massachusetts, not far from the historic (and spooky) town of Salem. He has endured a career as an IT professional, but his dream has always been to be a writer. A passionate Red Sox fan, Tom and a friend created Surviving Grady at the start of the 2004 season. Ten years and three World Series championships later, he still blogs about the Sox. Tom has a Masters Degree in English and Creative Writing from Southern New Hampshire University, and is a member of both the Horror Writers Association and the New England Horror Writers. His first novel, HAVEN, won the 2016 Bram Stoker Award for Superior Achievement in a First Novel. Tom’s second novel, ETERNAL DARKNESS, was released in early 2017. His novella, WEEKEND GETAWAY, is now available from Grinning Skull Press. Pete Kahle has been dreaming about writing novels since his teens, but after flirting with the idea in college, he spent 25 years working in a variety of careers before he finally stopped talking about it and started writing. He has lived in New York, Arizona and Spain, but now he resides in Massachusetts with his wife Noemi, his two children Zoe and Eli.. He is also a member of the New England Horror Writers Association. Pete is a voracious reader of horror, thrillers and science fiction novels and he writes in the same vein. THE SPECIMEN is his first novel. In 2015, Pete founded Bloodshot Books, a small press dedicated to cross-genre fiction that mixes the best of horror, science fiction, mystery, and thrillers. In October, the first anthology: NOT YOUR AVERAGE MONSTER: A BESTIARY OF HORRORS was unleashed and set loose. Volume 2 was released in February of 2016. He has also written BLOOD MOTHER, a stand-alone vampiric novel - without vampires.